The Polite Pig is known for, well, all things pig. And that is before anyone mentions all scrumptious sides and desserts that taste like they’re home-cookin’, but only if your cook at home was a James Beard recognized chef. Oh, and they’re also known for having a collection of bourbon so vast, that a tear comes to my eye when I look at my little shelf. Basically, The Polite Pig has a lot of things to say “please” and “thank you” for, and today we’re looking at two of the sweeter options on the menu. For starters, we need something to drink, all good meals start with a good drink. With the variety of options, between bourbons, beers, and craft cocktails, there is a lot to consider. However, it’s not every day that a restaurant has cocktails on tap, which The Polite Pig does. With that in mind, and wanting to see just what these Small Batch Cocktails would be like, I opted to try out the Sweet Tea Old-Fashioned. 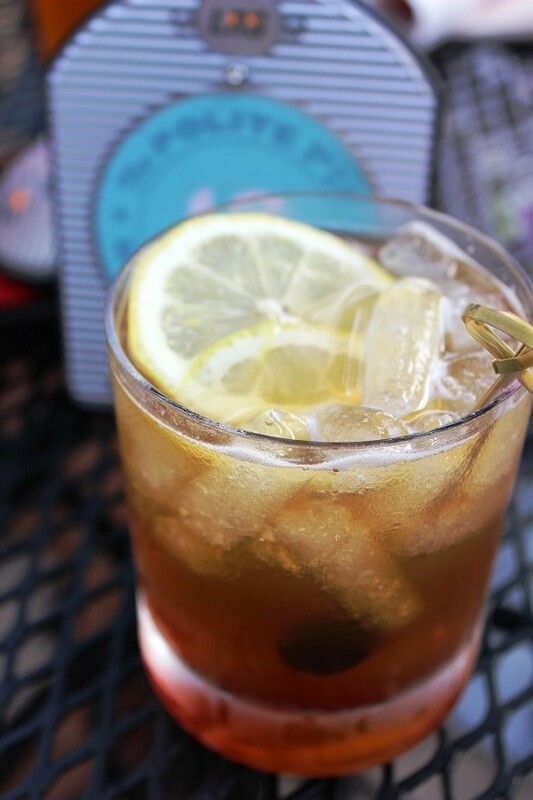 A concoction of bourbon, sweet tea syrup, and bitters, this isn’t your traditional old-fashioned. When it comes to an old-fashioned, I do tend to be a bit of a traditionalist. That said, this version of the cocktail was very smooth and not as astringent as a typical old-fashioned would be. It actually works very when paired with barbecue that, depending on your sauce preferences, can be vinegary and definitely savory. With the Sweet Tea Old-Fashioned, you get the sweetness that makes this very easy drink, but also those familiar spices from the bitters, which feel like an extension of a good barbecue rub. I’m not going to say that this is the be all-end all of cocktails, but for what you’re having and where you are, it is a decent offering. Plus, if you really want your traditional old-fashioned, you can always pick your bourbon and have the expert bartenders whip you up one. Staying with our sweet theme, we’re going to skip appetizers, entrees, and sides and move directly on to desserts. While there are a couple of options here, from Chess Pie to Carrot Cake, we opted for the specialty of the house, the Orange Blossom Honey Cake. For those of you that don’t know, orange blossom honey comes from bees that use the pollen from orange blossoms when they’re in bloom. It is a light-colored, incredibly sweet honey that also has a wisp of citrus flavor in the background. Growing up in Florida, surrounded by strawberry fields and orange groves, this is my favorite type of honey. What the Orange Blossom Honey Cake does is that this honey and ramp it up! 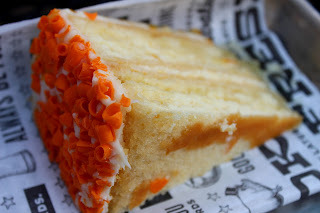 It is very sweet, but still retains, and maybe adds a bit more of, the orange flavors. The cake is dense and heavy, but the flavors are light. The frosting is also thin, which shows just how much The Polite Pig knows about baked goods. With as sweet as this cake is, it definitely doesn’t need an overabundance of frosting. If you like sweet desserts, and I cannot stress how sweet this cake is, then the Orange Blossom Honey Cake is definitely for you. If sweet isn’t necessarily how you like your desserts, this may not be for you. I for one, loved this dessert and cannot wait to get my next slice. From my experience at The Polite Pig, this restaurant lives at the corner of Savory Lane and Sweet Street. It is unlike many barbecue places I’ve been to, and I’ve seen my fair share, and it is a well-placed addition to Disney Springs. When it comes to living Sweet Street, they have got you covered, whether it is desserts or cocktails you are looking for, The Polite Pig has something for your sweet tooth to bite into.